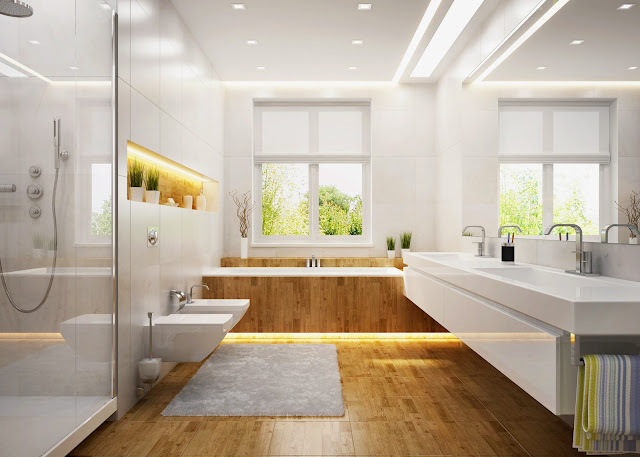 Bathroom is one of the most important spaces of your house. A modern bathroom looks elegant and has all the necessary amenities that make your time comfortable while using it. It is a place where we spend a lot of our private moments. Hence, it is an extremely important room in the house and so the place should be taken care of accordingly. The style of the bathroom should match with the rest of the house. Many things largely depend on the location of the bathroom. For, the interiors of the bathroom shouldn’t look out of place when it comes to the location. If you live in a modern setting with a modern house then it is inevitable that you have a modern bathroom. However, how much amenities you add to it will also depend upon the area that you live in. If you live in a metro where everything is easily accessible, you can go for any sophisticated design that you like. If not, it isn’t difficult to order things online but you will have to know your limits. If you live in a luxurious setting such as on the sea-coast or on a beach island, then your bathroom has to be luxurious. While getting it ready, make sure that you have a proper service for all the equipments and amenities that you add to it. Raw materials from all over the world are available at affordable prices. With the help of internet it is just few clicks away. The price range of raw material and the installation services vary from one place to another, and so one will have to decide upon an estimated budget before indulging into this project. For, if you have to order raw material, you will have to know your budget and then accordingly order the quantity and the size. Some raw materials such as tiles will differ in cost with regards to their size. Some of them will be priced exuberantly while others will come at an affordable cost. While bath tiles are easily available in the market, there is enough variety to confuse the buyer. Also, some houses have more than one bathroom. Needless to say, the kid’s bathroom will be designed differently than your bathroom. You could style your bathroom according to a theme or do up one of the popular modern styles. From cabinets to flat panels, anything can make your bathroom look beautiful. The definition for a modern bathroom is different across the globe. There is the Asian designs, Arabian designs and many other choices in this regard. You can knock your socks off doing your bathroom or you can quickly use some help and hit upon a conclusion. It is not a bad idea to put in things such as furniture or panels in the bathroom. These things are a requirement in modern bathroom settings. However, it is best to take out time and consider various other options that you can see on the internet, home decor magazines and local vendors. This will help you to choose the best design for your bathroom. Hope you like above mentioned details on Modern Bathroom. If you want to know more about Bathroom then let’s have look and see designs.